Quinton Rose of Temple splits Brendan Adams (left) and Sidney Wilson of Connecticut as he goes up for a basket at the Liacouras Center. Realizing that every game could have NCAA implications, Temple wasted little time in making quick work of Connecticut on Wednesday night. Speeding out to a 46-20 halftime lead, the Owls coasted to an 81-63 American Athletic Conference victory at the Liacouras Center. “We have been in a lot of dogfights and it was relaxing to have a kind of a relaxing game," said Temple guard Shizz Alston, who scored a team-high 18 points, hitting 4 of 8 from three-point range. Temple (17-6, 7-3 AAC) equaled last year’s win total when the Owls went 17-16 and fell to eventual champion Penn State in a first-round NIT game. Nate Pierre-Louis, bottom, of Temple gets a shot off despite being fouled by Tyler Polley of Connecticut during the 1st half at the Liacouras Center on Feb. 6, 2019. With eight games remaining until the AAC Tournament, Temple, is approaching each game as a playoff. The Owls are among the first four out of the NCAA Tournament in the latest projections by ESPN’s Joe Lunardi. In addition to Alston, Nate Pierre-Louis scored 17 points for the Owls. Josh Carlton and Christian Vital each scored 18 for UConn. For the first time this season, Temple center Ernest Aflakpui wasn’t in the starting lineup because of a left knee injury. 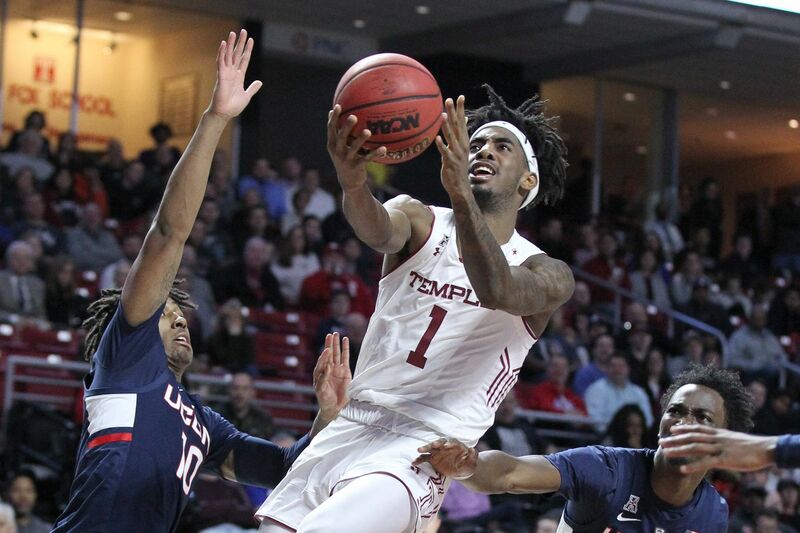 Temple coach Fran Dunphy says he hopes that Aflakpui can play in Saturday’s game at Tulsa. Sophomore forward J.P. Moorman, usually a major spark off the bench, made his first career start for Temple. The Owls’ Justyn Hamilton, a 6-foot-10 sophomore, made his third straight start and ended up scoring a career-high 13 points, shooting 6 of 7 from the field. “My confidence level is at an all-time high,” Hamilton said. Justyn Hamilton, right, of Temple shoots over Josh Carlton of Connecticut during the 1st half at the Liacouras Center on Feb. 6, 2019. The starting lineup helped the hosts come out blazing. Temple hit its first six shots and 10 of 11 in scoring its most first-half points this season. The Owls shot 18 for 29 (62.1 percent) and were 5 of 11 (45.5 percent) from beyond the arc in the first half. “We came out soft in the first half,” UConn coach Dan Hurley said. Hamilton had 11 points in the half, hitting 5 of 6 from the field. UConn (13-10, 4-6) had trouble dealing with his athleticism around the basket. The Huskies experienced more misfortune in the first half when leading scorer Jaylen Adams left the game for good with 14 minutes, 6 seconds remaining after he and Temple’s Moorman collided. Moorman fell on Adams, who had to be helped off the court. He suffered a left knee injury and Hurley said Adams would have an MRI exam on Thursday. The other Temple scorers in double figures were Quinton Rose, who had 12 points (and a season-high nine rebounds), and guard Alani Moore, who came off the bench to score 11 points, hitting 3 of 4 three-pointers. The Owls were 11 of 23 from three-point range. Nate Pierre-Louis of Temple goes up for a dunk after coming up with a steal against Connecticut during the 2nd half at the Liacouras Center on Feb. 6, 2019.